A significant event occurred for Humanity and Gaia the Rose Ray of Creation was anchored back on the planet, in Sedona AZ, at the Cathedral Rock Vortex. The Mother Mary Visitations occurred on Christmas Eve 2011 to anchor the Rose Ray of the Sacred Heart through the Holy Spirit of Shekinah. This is bringing the Mother of the World’s Heart to transforms the sadness of human suffering that awakens the Angelic Human DNA and Christ Embodiment. 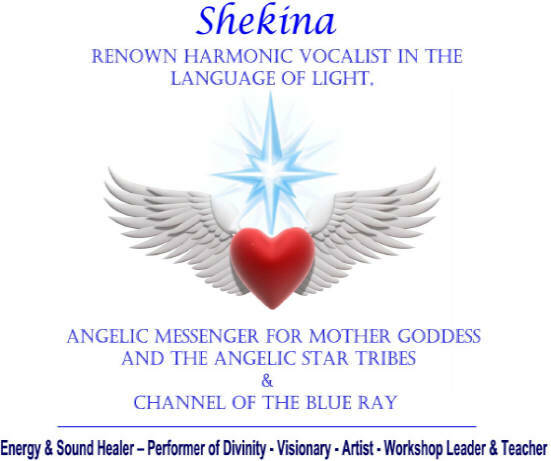 ShekinaRose, Angelic Priestess of Light, has been anointed by Mother Mary in the Rose Ray, and is a Angelic Song Messenger of Mother Goddess SHEKINAH, in the ‘Language of Light’, 528 Hz Miracles, Love & Transformation, the Ancient Solfagio Angelic Frequencies, that will assist you in activating you ‘Divine Original Blue Print’, your Christ Template.